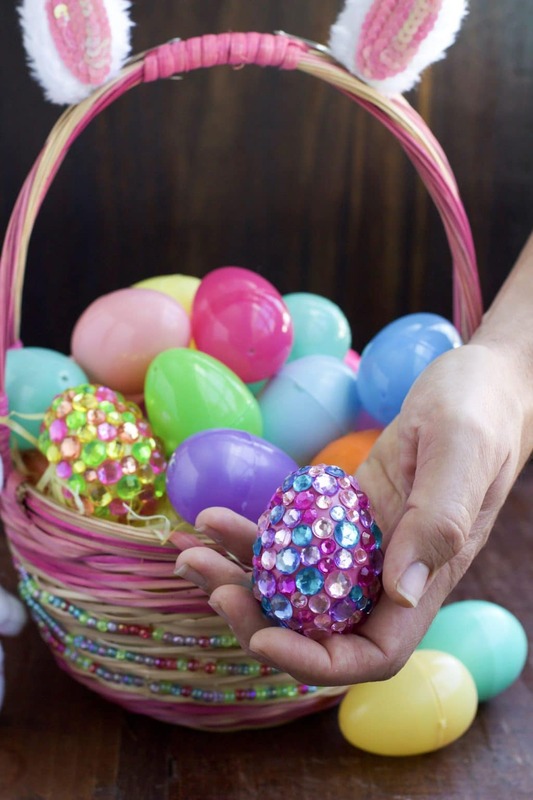 Make your Easter morning egg hunt extra special with these DIY jeweled Easter eggs! Super simple to create and you don’t need a glue gun! When I was little, my parents went all out for Easter! My mom stuffed lots of eggs and made us the most beautiful baskets, and my dad dressed up as an Easter bunny and hopped around our side yard dropping eggs for us to collect. My mom would wake us up early and we would excitedly run to the big window that overlooked the side yard. We stood up on our tippy toes to see over the windowsill and looked for the daddy-sized Easter bunny. Without fail, our Easter bunny showed up every year. It was like magic! Instinctively, Brian and I both knew to look for the special eggs. Yes, of course, we wanted all the eggs but there were a few eggs that stood out from the rest. All the eggs had candy in them, except, the shiny gold and silver eggs had little toys or money in them! I think my mom liked to build the anticipation because after we got to look out the window, we had to get dressed in our special Easter outfits, comb our hair, brush our teeth, etc. before we could line up with our baskets by the front door. We would be practically dying from excitement by the time we took a few pictures and inched our way around to the side yard. Once we could see Easter eggs within reach, there was no distracting us. As soon as mom said we were free, we would both take off as fast as we could. Not ready for Easter? 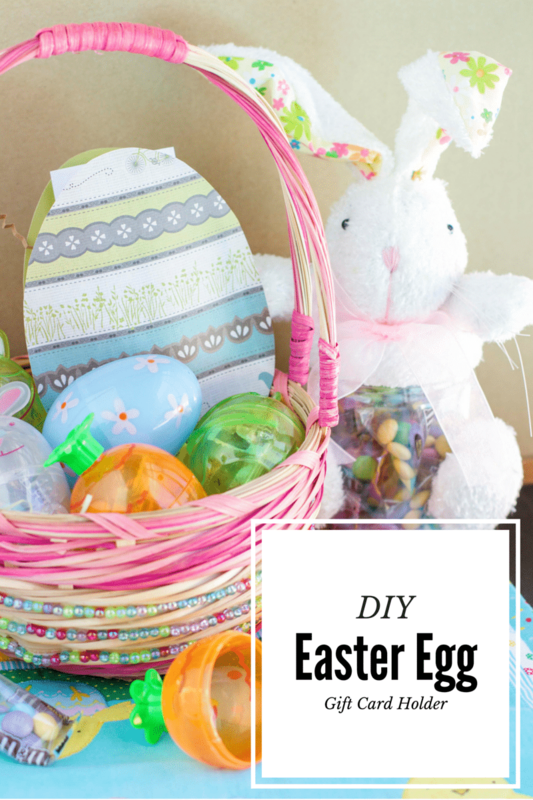 Follow my easy tutorial to make your own Easter egg gift card holder! Super simple, and it only takes 5 minutes to create. Easter is in 5 days! How did it creep up on us so fast? I actually like it better when Easter is in April, rather than March. I mean, St. Patrick’s day was just a few days ago, why do they have to be so close together? We just finished our leftover corned beast (yes, I call it corned beast, not corned beef) last night, and we still have shamrock decorations out for goodness sake! ? So, for everyone who might also be running a bit behind– like me. I bring you this easy DIY Easter gift card holder craft. All you really need is construction paper, scissors, and a glue gun. If you want to step it up and be a little fancy, then you can use card stock with a cute pattern on it to make the gift card holder. I went to the craft store, and got some individual sheets of patterned card stock that I thought looked spring-like to make my eggs with. If you don’t have time to make an Easter basket, or have some older teenagers that you want to give an easy Easter gift to, this is perfect! Who doesn’t like gift cards? With this handmade gift card holder, it looks like you still put a lot of effort into making it for them. But not really, because they are really simple to make! Pinky promise!